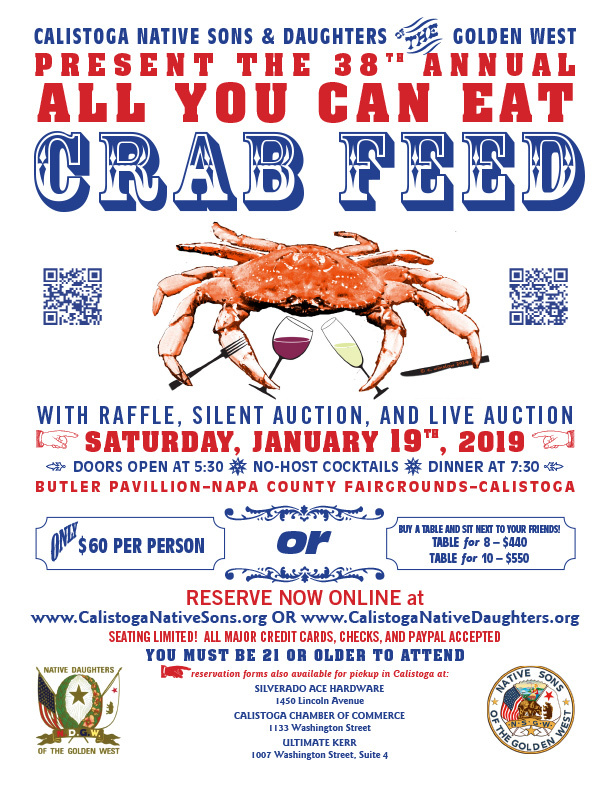 Calistoga Parlor meets on the fourth Tuesday of each month at the at the Napa County Fairgrounds, Calistoga, with social time from 6:00 pm to 7:00 pm, dinner and the meeting to follow. Sold Out! Thank you Everyone! The Native Sons of the Golden West is a fraternal organization founded for mutual benefit, mental improvement, social actvities, and the progress of the State of California. Our motto is Friendship, Loyalty, Charity. To the pioneers belonged the birth and infancy of our state—to us, its destiny. Native Sons are 18 years of age or older and are born in California. To find out more about the Native Sons of the Golden West fraternal organization and what it does, visit the Loyalty-NSGW page. To find out more about Calistoga's Parlor 86, visit the Friendship-Parlor 86 page. Parlor 86 encourages all California citizens to be involved in their communities. To that end, we provide information for all citizens to be involved in their communities on the Charity-Get Involved page and the Links + Resources page. If you are interested in promoting local education and preserving the amazing history of California—and are over 18—and born in California, then membership in the Native Sons of the Golden West could be for you. Click on the Become a Member button above to fill out a application for membership form.